Born in England in the 19th century, Archibald Belaney immigrated to Canada and took on the identity of Grey Owl during his time with the Ojibwe people. 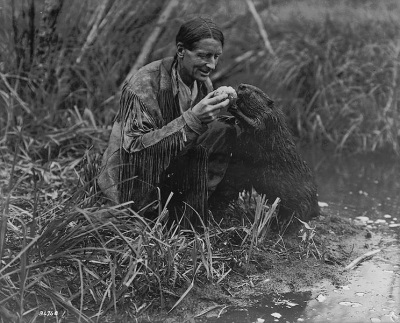 He transitioned from working as a trapper to a conservationist later in life, becoming one of the earliest advocates in the 20th-century environmentalist movement. Through books, lectures, articles, and films, Grey Owl spread his message beyond Canada's borders, encouraging people everywhere to re-evaluate the relationship modern civilization has with the environment. We remember Grey Owl's life today as well as the lives of other notable people who died this day in history. Click to discover notable people who were born this day in history including teen idol Jonathan Brandis. 2018: Art Bell, a radio host who was best known for a paranormal-themed nightly show syndicated on hundreds of stations in the 1990s, dies at 72. 2017: Dan Rooney, chairman of the Pittsburgh Steelers, dies at 84. 2016: Nera White, U.S. one of the first female basketball players inducted into the Basketball Hall of Fame, dies at 80. 2015: Günter Grass, German author known best for his first novel "The Tin Drum," dies at 87. 2013: Vincent Montana Jr., U.S. percussionist and arranger known best as a member of MFSB whose song "TSOP (The Sound of Philadelphia)" served as the theme song for "Soul Train," dies at 85. 2013: Chi Cheng, U.S. musician and bassist for the alternative metal band Deftones, dies at 42. 2013: Frank Bank, U.S. actor known best for playing Clarence "Lumpy" Rutherford on the classic sitcom "Leave It to Beaver," dies at 71. 2012: Marilyn Lovell Matz, U.S. actress who appeared on such television shows as "The Munsters" and later became an AIDS activist, dies at 81. 2009: Harry Kalas, U.S. sportscaster who was the voice of the Philadelphia Phillies from 1971 until 2009 and who also was the voice for NFL Films, dies at 73. 2009: Mark "The Bird" Fidrych, U.S. Major League Baseball pitcher for the Detroit Tigers who was the 1976 American League Rookie of the Year, dies at 54. 2006: Muriel Spark, Scottish author known best for her novel "The Prime of Miss Jean Brodie," dies at 88. 2005: Johnnie Johnson, U.S. pianist and a longtime member of Chuck Berry's backing band, dies at 80. 1998: Patrick de Gayardon, French skydiver and sky surfer who performed stunts while wearing his wing suit, dies during a jump at 38. 1986: Stephen Stucker, U.S. actor known best for his role as the manic control-room worker "Johnny" in the "Airplane!" movies, dies of AIDS at 38. 1978: Paul McGrath, U.S. actor known best for his radio appearances in the 1940s and '50s and for his role on "The Edge of Night," dies at 74. 1975: Larry Parks, U.S. actor who was nominated for an Academy Award for playing Al Jolson in "The Jolson Story," dies at 60. 1954: Samuel Jones, U.S. athlete who won a gold medal in the high jump in the 1904 Olympic Games in St. Louis, dies at 74. 1941: Annie Jump Cannon, U.S. astronomer whose work proved instrumental in the development of contemporary stellar classification, dies at 77. 1938: Grey Owl, born Archibald Belaney, English-born Canadian author and conservationist, dies at 49.